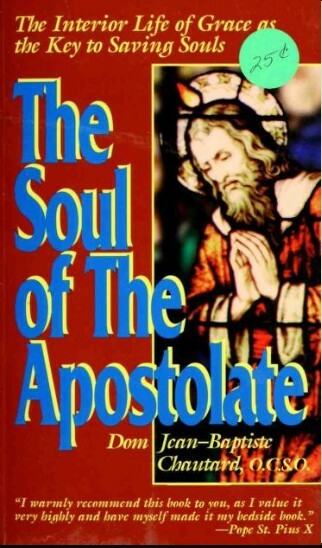 Here’s a little book I picked up a few years ago and have found helpful: The Soul of the Apostolate by the Trappist abbot Jean-Baptiste Chautard (1858-1935). I’m reading it as an evangelical Protestant and commending its virtues from that point of view, but in case you can’t pick on the VERY SUBTLE CLUES the book is quietly sending you, I want to advise you that it is a very Roman Catholic book. So Very Roman. In a few places, the Roman Catholic elements are not merely decorative, but material: the book ends by commending “habitual and enthusiastic” devotion to Mary (“we lay down this little book before the throne of Mary Immaculate;” Mary has “acquired a sort of jurisdiction over every temporal mission of the Holy Ghost,” etc. ); the Roman view of apostolic succession undergirds some of the argument and becomes explicit a few times; and so on. So if disagreeing about those things will be an obstacle that keeps you from getting the good things from this book, consider yourself notified, and don’t try reading this. Beyond that, there is a kind of language or culture barrier to climb in order to get the good out of this book. It just bristles with terms like interior life, custody of the heart, mental prayer, and of course, the apostolate in the title. About that apostolate: it means an organization for spreading the gospel and Christian influence in the world, especially an organization by laypeople. Chautard would probably call the work of priests and religious (religious as a noun: monks, nuns, etc.) their ministry, reserving that word for the ordained in a way that evangelicals wouldn’t. But apostolate refers to the extended work of all believers intentionally carrying out the work of propagating Christian truth and influence. We are all sent, apostled, into the world to work for Christ. The most important document on the subject is probably Vatican II’s Decree on the Apostolate of the Laity. (Chautard, recall, is decades before that 1965 decree: popes as early as Pius X have commended his book, and popes as recent as Benedict XVI). The vision here is of a great sending-out that starts with Jesus and involves every believer down through the ages. It involves action, activity, projects, plans, organizations, and active work in all parts of the world: that’s the apostolate. May these humble pages go out to to the soldiers of Christ, who, consumed as they are with zeal and ardor for their noble mission, might be exposed, because of the very activity they display, to the danger of not being, above all, men of interior life! …The thoughts developed in this book have helped us ourselves, to fight against an excessive exteriorization through good works… May they show that we must never leave the God of works, for the works of God. For a man, in his practical conduct, to go about his active works as if Jesus were not his one and only life-principle is what Cardinal Mermillod has called the “Heresy of Good Works.” …Is this not, in practice, a denial of a great part of the Tract on Grace? Heresy of Good Works! Feverish activity taking the place of God; grace ignored; human pride trying to thrust Jesus from His throne; supernatural life, the power of prayer, the economy of our redemption relegated, at least in practice, to the realm of pure theory; all this portrays no merely imaginary situation, but one which the diagnosis of souls shows to be very common though in various degrees, in this age of naturalism, when men judge, above all, by appearances, and act as though success were primarily a matter of skillful organization. The solution offered in Soul of the Apostolate is cultivation of the interior life. Most of the book is an account of how busy people can take proper care of their spiritual lives by devoting their hearts to Jesus, practicing the presence of God, guarding their hearts, shepherding their thoughts, relying on the leadership of the church, and participating in its liturgical life. Part of the power of reading this kind of book, for me, is the readerly work of translating it into the evangelical idiom. We would probably reach for conventional language like devotions and quiet time, and we would be very comfortable with the strongly emotional and interpersonal language of fellowship with Jesus (“All that Jesus wants is our heart,” says Chautard). The fundamental soundness of Chautard’s counsel is evident, and anybody who’s been around an active Christian (yay) who’s lost touch with their deep reasons for serving (boo) will instantly recognize the type, and be grateful for the clear account of the only cure. The Soul of the Apostolate excels in describing how powerful and attractive the deeply-grounded life will be as it expresses itself in the outer world. It also has a fine Trinitarian background, about which I hope to write more on another occasion. ¹The English translation is by celebrity monk Thomas Merton, who also wrote an introduction. The online version I linked above identifies the translator only as “A Monk of Our Lady of Gethsemane,” but most editions now in print will gladly name that heppest of Trappists. ²The original title was even worse: Apostolat des catéchisme et vie intérieure devenu L’âme de tout apostolat, but he wrote it on a boat so there’s that excuse. Speaking of boggling at opacity, you can rearrange the letters in “The Soul of the Apostolate” to spell “Ooh, Thou Softest Patellae” and “Tattletale’s House of Pooh.” But can doesn’t imply ought.